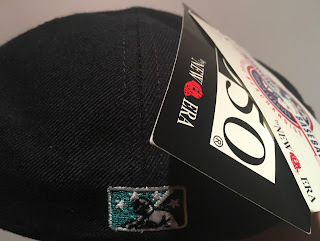 Y'all know I've been going hard in the paint with the vintage Single A Short Season caps lately but what you need to know about this week's Bellingham Mariners cap is that it is over 20 years old and today I'll finally be popping the tags on this deadstock fitted. In 1993, the Seattle Mariners cap adopted a navy blue, silver and teal colorway. The Baby M's of the Northwest League took up tealism that year as well however they wore this cap for only more season after that because they became the Bellingham Giants in 1995. I would hope you agree that the tags on an MILB fitted cap from the 1990's are a true thing of beauty. 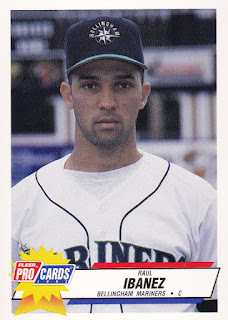 Fewer low ball teams wore fitted caps in the mid-90's than today but remember Bellingham had a higher profile based on the MLB success of former Baby M's like Edgar Martinez and Ken Griffey, Jr. The rebrand of the big club in Seattle might have played a role here as well. While the Kid and Edgar wore the previous version of the Baby M's cap, the most notable player who wore the 1993-94 cap was Raul Ibanez. I'm always amazed when I'm reminded that he started as a catcher. Speaking of memories, it was just over a year ago that I referenced Ibanez in a post about a cap worn by the Riverside Pilots who were another Single A Mariners affiliate from the mid-1990's. I stated with clear certainty in that Pilots post that the MILB batterman first appeared in 1995 1994 so I must ask myself, how is it possible for the Baby M's to have it on this cap if the team did not even exist in 1995? I've come to learn the batterman must have started to show up earlier than 1995 so I estimate this Bellingham cap is from 1994. I have no video or photographic proof to support this claim but I did find a baseball card from 1993 where a Baby M appears to be wearing a snapback version of this cap. It's possible there was a snapback alongside the fitted version but I'm not ready to believe that a cap from 1993 also had the MILB batterman logo on it. Of course if 1994 is the benchmark for the batterman then I suppose this Fort Wayne Wizards post should be updated to reflect this change in opinion. Thanks for coming back to read about this super-rare cap that is very special to me. This cap isn't for sale or trade however don't hesitate to reach out if there's something you like on the Trading Block and you are willing to part with any of the hats on my Wish List.